This inspiring volume presents unique insights from leading international scholars, activists, educators and thought leaders on the contemporary relevance of Gandhi’s ideas and actions. 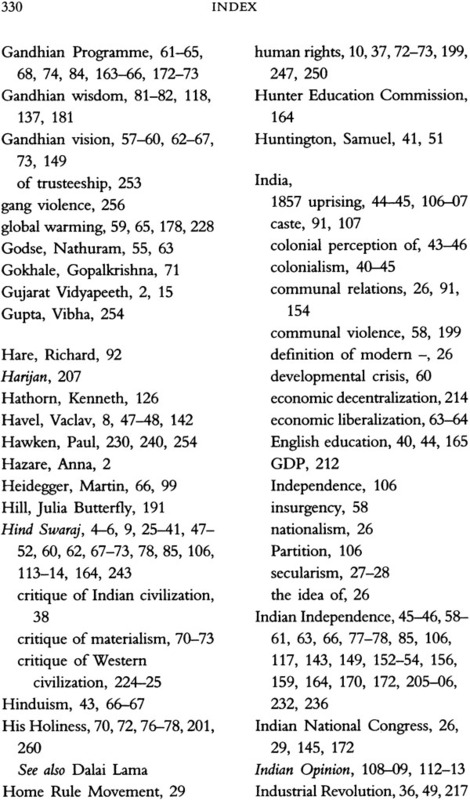 The essays here reveal that for Gandhi legitimate coercion by the state in certain cases was compatible with ahimsa; a balance between spiritual and material values was essential for a true civilization, and swaraj anchored in self-discipline and self-restraint was an imperative for sustainable ways of life. 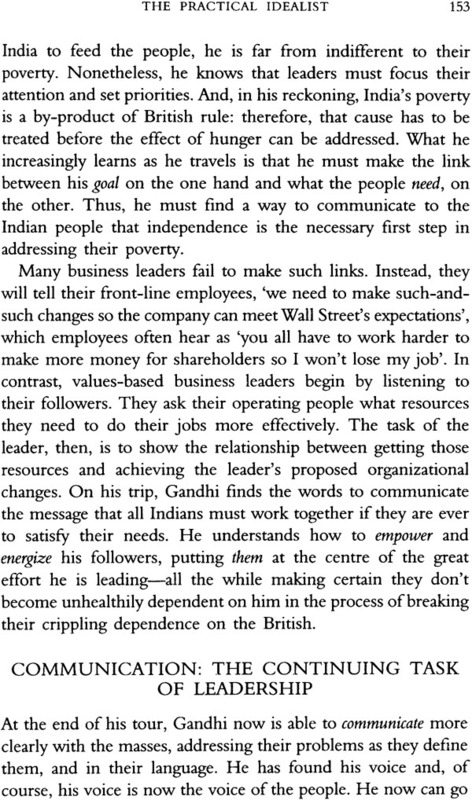 significance of Gandhi’s wisdom for a just and peaceful world. Tara Sethia is a professor of history and the founding director of the Ahimsa Center at California State Polytechnic University, Pomona. She led the task of establishing on campus the degree programme for an interdisciplinary minor in Nonviolence Studies. She teaches Indian history and core courses in the Nonviolence Studies programme and directs summer institutes for K-12teachers. She is the author of Gandhi: Pioneer of Nonviolent Social Change (2012) and has edited Ahimsa, Anekanta and Jainism (2004). She received her doctorate in history from the University of California, Los Angeles. Anjana Narayan is an assistant professor at California State Polytechnic University, Pomona. Her areas of interest include ethnicity, gender and migration. She is the co-author of Living Our Religions: Hindu and Muslim South Asian-American Women Narrate Their Experiences (2009) and co-editor of Research beyond Borders: Interdisciplinary Reflections (2012). She received her doctorate in sociology from the University of Connecticut and a postgraduate degree in social work from the Tara Institute of Social Sciences (TISS), Mumbai. 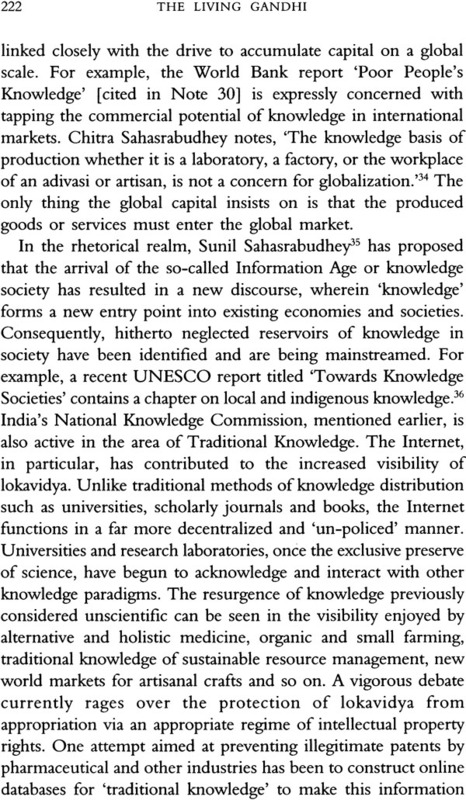 This volume of essays evolved from an international conference in 2008 hosted by the Ahimsa Center at California State Polytechnic University in Pomona. Established in 2004, the Center is dedicated to creating a culture of nonviolence and peace through its various programmes and activities. In addition to biannual international conferences, the Center’s initiatives include an interdisciplinary programme in Nonviolence Studies for undergraduate students, residential summer institutes for elementary and high school teachers from all over the United States in education about nonviolence and nonviolent social change and a series of public lectures, dialogues and workshops. These programmes focus on ahimsa and its exemplars. Underlying the Center’s mission and vision is the conviction that ahimsa is nonviolence rooted in courage and compassion, fearlessness and forgiveness. It connotes reverence for all life. It evokes civility and trust, and it promotes lasting peace and happiness in society. 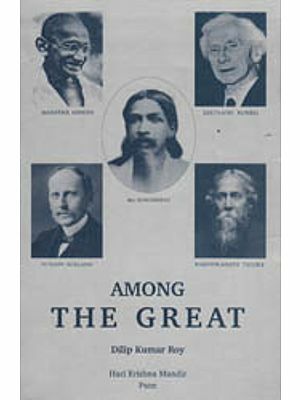 The 2008 conference focused on rediscovering the wisdom of Gandhi who, in addition to having had many other roles, was a pioneer of nonviolent social change, an aspect that was an inspiration for the founding of the Center and also for my book Gandhi: Pioneer if Nonviolent Social Change. The conference appeared timely for a variety of reasons. While directing the Center’s activities, teaching about the history of nonviolent social change and working on my book, I was both overwhelmed and intrigued by the scope and scale of Gandhi’s outreach in dealing with the major challenges of his time. As my interest in Gandhi grew, I was particularly struck by the manifestation of his wisdom and the pragmatism of his ideals that suggested their wider applicability in contemporary contexts. The key stake holders of the Center-the students, college faculty, schoolteachers and the larger community-share a common interest in exploring new solutions to many of the critical challenges we face: the growing forms of violence in almost all spheres of life, especially in schools and colleges, continuing warfare and conflicts around the world, escalating stark realities of social injustices, the increasing economic inequality and the impending threat of ecological collapse. Not only did these challenges make the conference’s focus on Gandhian wisdom very compelling, but its timing roughly coincided with two important centennials associated with Gandhi’s life and work. In 1908 Gandhi launched his first revolutionary satyagraha campaign in South Africa, and in 1909 he wrote Hind Swaraj-widely regarded as his seminal work. Both these events in Gandhi’s life were momentous and assumed transnational significance in the decades that followed. Empowered by the soul force, satyagraha became Gandhi’s modus operandi for combating political oppression and socio-economic injustice. Subsequently, it also became a source of power to the powerless and of hope to the hopeless as Gandhi became a catalyst for nonviolent movements for social and political change around the world. Hind Swaraj, containing both the flowers and seeds of Gandhian thought, has been a focal point of entry into Gandhian studies and a vital source that shapes our understanding of Gandhi’s perspectives on civilization and freedom, ahimsa and social justice, social responsibility and human welfare. The conference was thus planned as a collective celebration of Gandhi’s gifts to humanity on the one hand and as an exploration and examination on the other of how the lessons from Gandhi and his life have been and can be applied meaningfully to find enduring solutions for the vexing personal, interpersonal, social and political problems we face today. Conceptualized to be more than an academic discourse, the conference brought together leading international Gandhian scholars, thought leaders and practitioners of Gandhian values, representing a variety of disciplines and domains. It became a forum to explore the relevance of Gandhi’s thought as well as his actions, his life and his movements to our time and our challenges. It also provided a major impetus for examining the role of education about nonviolence in schools and colleges for fostering a culture of peace. The fresh insights and interpretations of Gandhian wisdom and the innovative ideas for its application to contemporary situations during the conference became the basis for The Living Gandhi. There has been a surge of interest in Gandhi and nonviolence, especially since the turn of this century. In the United States, programmes in Peace and Conflict Resolution Studies and Nonviolence Studies have been attracting growing attention. Documentary series such as A Force More Powerful, illuminating cases of nonviolent movements that followed Gandhi’s, have made a wider public aware of the significance of his ideas and actions. Around the world Gandhi continues to be a focus of conferences and symposia, of performing arts and exhibitions, and of blogs and websites. In 2007, the United Nations underscored Gandhi’s universal significance by declaring 2 October, his birthday, the International Day of Non-violence. Google displayed the image of Gandhi in place of the letter ‘G’ in the logo on its home page to mark Gandhi’s 140th birthday in 2009. Like Apple’s advertising campaign ‘Think different’, a few years earlier Google made Gandhi’s presence almost ubiquitous in the digital domain. 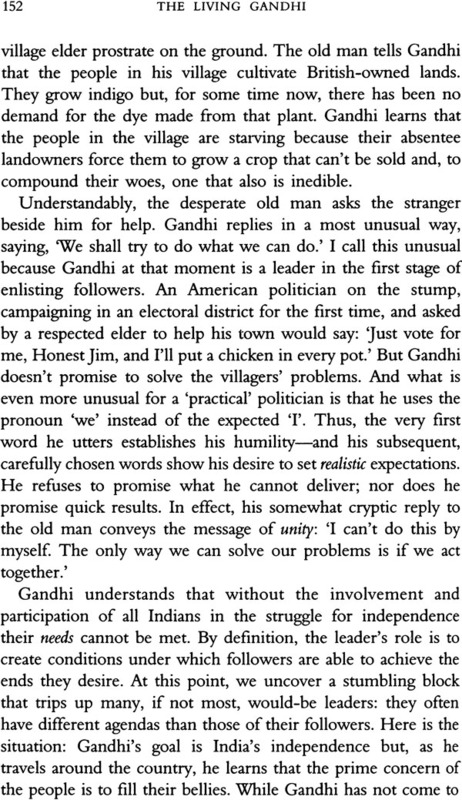 Gandhi appears to have captured the imagination of Indians in a new way. He is not only represented in currency, statues, posters and T-shirts, but also in new media and in new ways. The Eternal Gandhi Multimedia Museum in Delhi attracts thousands of visitors every day. Bollywood comedies such as Lage Raho Munnabhai have made Gandhi’s basic message more accessible to ordinary people. It appears that Gandhi’s way of life too is drawing attention once again. Thousands of young men and women are joining Gandhian organizations, participating in summer camps or volunteering to work in slums and villages. Narayan Desai-son of Gandhi’s secretary Mahadev Desai-who grew up in Gandhi’s ashram and currently-serves as the chancellor of Gujarat Vidyapeeth (the university founded by Gandhi), has also contributed to the revival of public interest in the Mahatma’s life and work. In his late eighties, Desai, who is the author of a four-volume biography of Gandhi, has been narrating Gandhi Katha (or Story of Gandhi), a week-long performance in various places in India and abroad, thus bringing Gandhi back into the public consciousness. Many activist organizations draw their inspiration from Gandhi. In India hundreds of non-governmental organizations have been inspired by Gandhi’s Constructive Programme, while using satyagraha as a method to protest injustice and exploitation. Vandana Shiva’s seed satyagraha in support of indigenous farmers, Medha Patkar’s campaigns for the rights of the adivasis in the face of globalization of industrial capitalism, and the most recent anti-corruption movement led by Anna Hazare, have revived the memories of Gandhi’s satyagraha campaigns. These are only a few examples illustrating that Gandhi lives in our times as his ideas and lessons continue to resonate in many different spheres. The scholarship on Gandhi is not only vast and varied, but is constantly growing as is evident from the publication of numerous books on him just in the last five to seven years. These books uncover new sources of information about Gandhi and offer fresh interpretations of his ideas and actions. Kathryn Tidrick’s portrait of Gandhi departs from the image of him as the ‘secular saint’ and suggests that his political struggles were informed by his deep religious beliefs. In contrast to the cliched view of the ‘spiritual’ Gandhi, Anthony Parel contends that Gandhi sought a harmonious balance between spiritual and material pursuits. 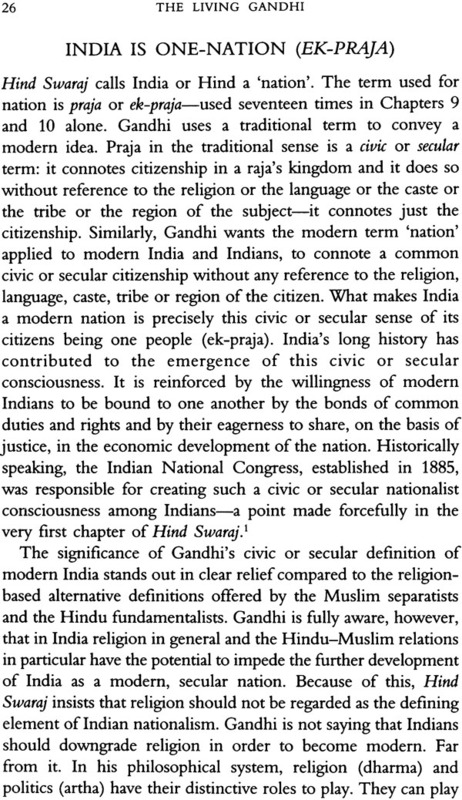 Simone Panter-Brick sees this very notion of harmony embedded in Gandhi’s concept of swaraj as self - development and self-control the basis for an independent Indian nation. 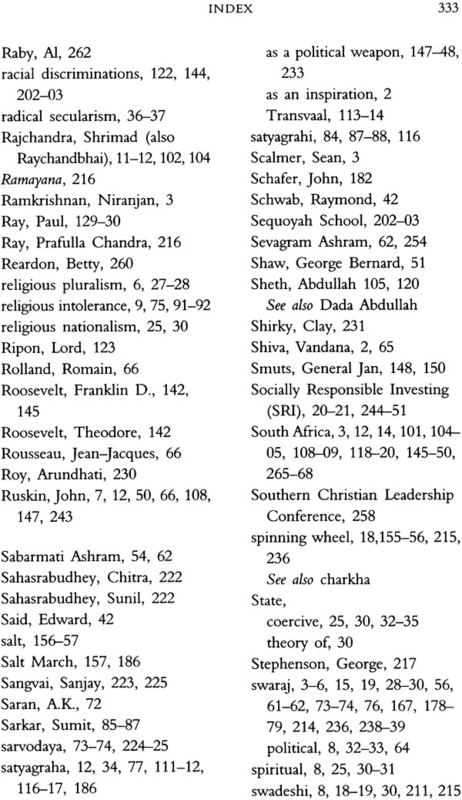 Although Gandhi was a pioneer of nonviolence as a force for individual and social transformation and a trailblazer for worldwide nonviolent movem.ents for social and political change, Faisal Devji locates the origins of Gandhi’s ahimsa in the violence of war and conquest that characterized the late nineteenth and the first half of the twentieth-century world. 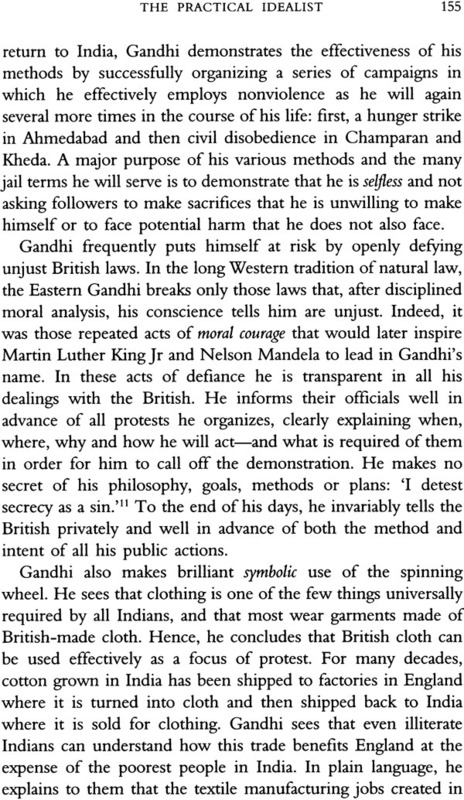 Relying on new sets of evidence, Charles DiSalvo suggests that for Gandhi the courtrooms of South Africa were the real fields of experiments which led him on the path to nonviolent civil disobedience. 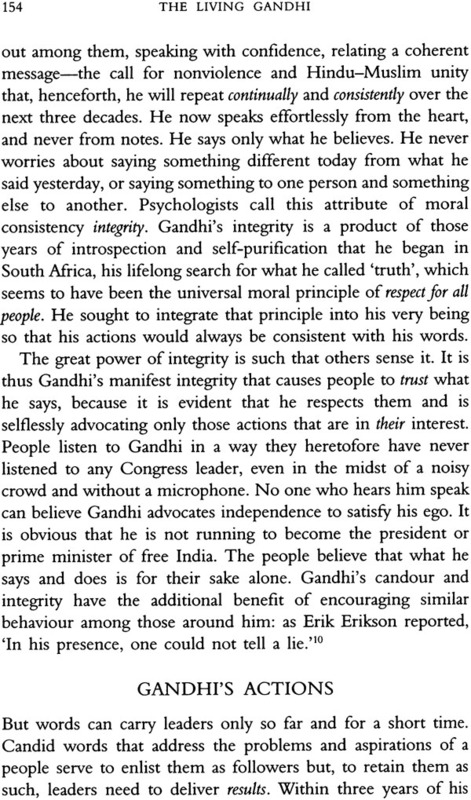 Joseph Lelyveld reinforces the view that South Africa played a critical role in shaping Gandhi’s thoughts and actions. And it was in South Africa again, according to James Douglass, that Gandhi first confronted and learned to overcome the fear of death which enabled him to confront his assassin with love. Rajmohan Gandhi’s comprehensive biography of Gandhi draws upon the family archives, revealing new aspects of Gandhi’s life. Illustrating the global impact of Gandhi, Sean Scalmer documents the widespread discussion and debate Gandhi’s nonviolent protests spawned in Britain and the United States. 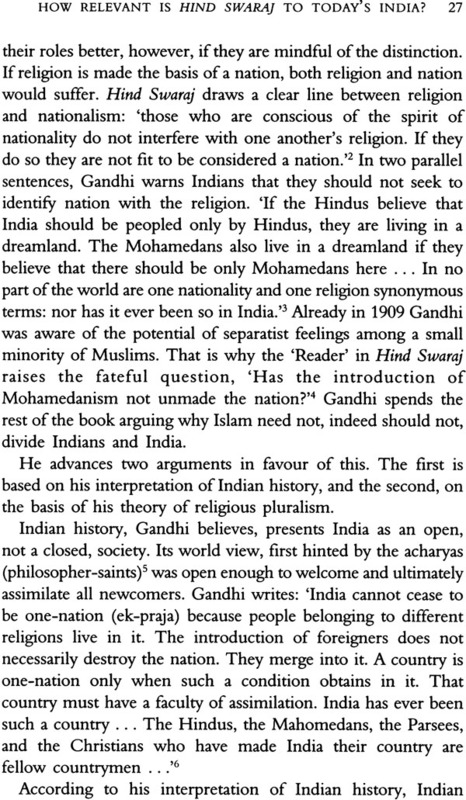 Challenging the notion that Gandhi was a ‘traditionalist’ who, far from being a futurist, was a ‘back number’, Lloyd and Susanne Rudolph position Gandhi as a ‘postmodern’ thinker. Niranjan Ramkrishnan examines the relevance of Gandhi’s ideas to the problems of today, including terrorism and globalization. While David Cortright traces Gandhi’s influence beyond India, Thomas Weber suggests, against the view of many Gandhians, that Gandhi is very much alive in India. The growing global significance of Gandhi, in spite of the debates, controversies and critiques surrounding his life and work, is one of the major reasons for the proliferation of scholarship about him. Gandhi today evokes diverse and deep interests among admirers and critics alike. 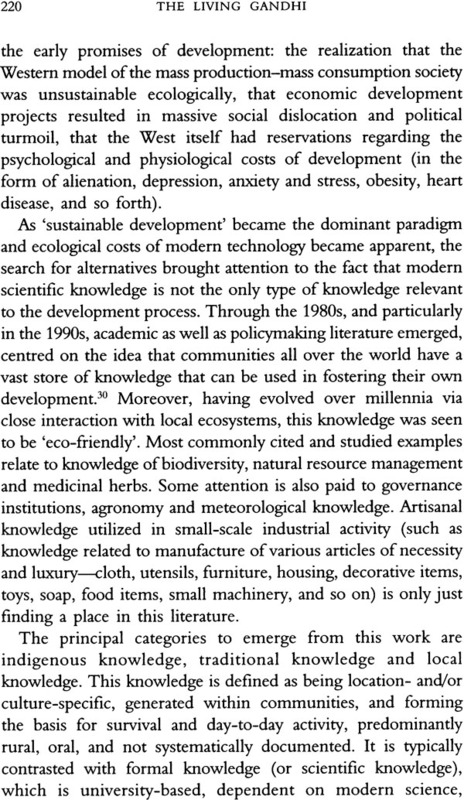 This volume has several distinctive aspects. First, it brings together transnational insights of scholars, activists, educators and thought leaders on the living Gandhi-that is, the ideas and actions of the historical Gandhi-as well as the Gandhi who continues to live through his message, which resonates in various ways. 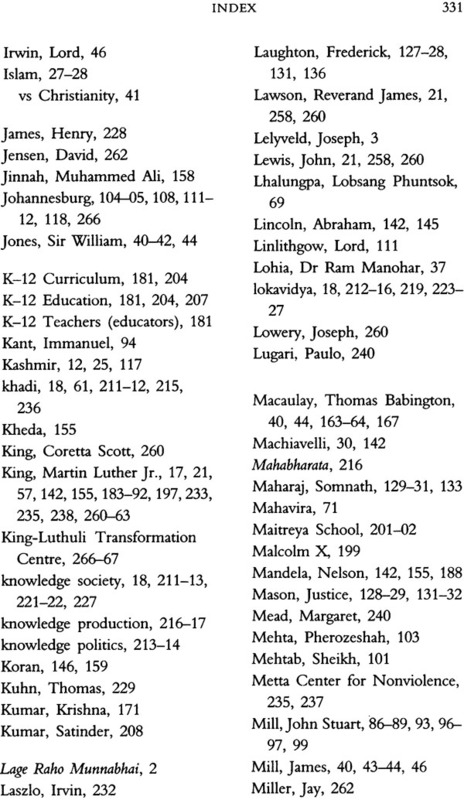 Second, the contributors in the volume reflect on Gandhi’s lessons and their significance in contemporary contexts from the perspectives of their various disciplines-history and philosophy, political science and journalism, economics, business and law, education and social work. 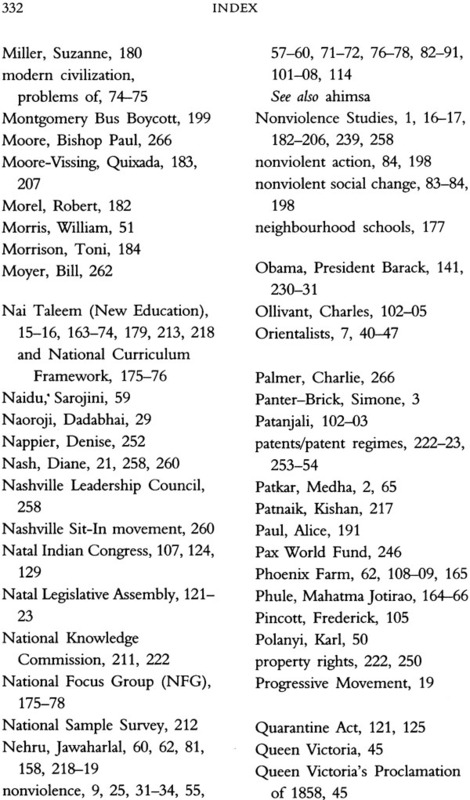 Third, it also includes a classroom perspective on Gandhian wisdom from elementary and high school teachers, who offer sharp insights on its significance in schools, especially in the United States, where violence has been on the rise in recent years. Finally, this volume offers nuanced interpretations and novel applications of Gandhi’s concepts of ahimsa, swaraj and trusteeship-ways of living Gandhi-and their global implications for social justice, value-based leadership, emerging knowledge societies, socially responsible investing and entrepreneurship, transformative education and conflict resolution and peace. 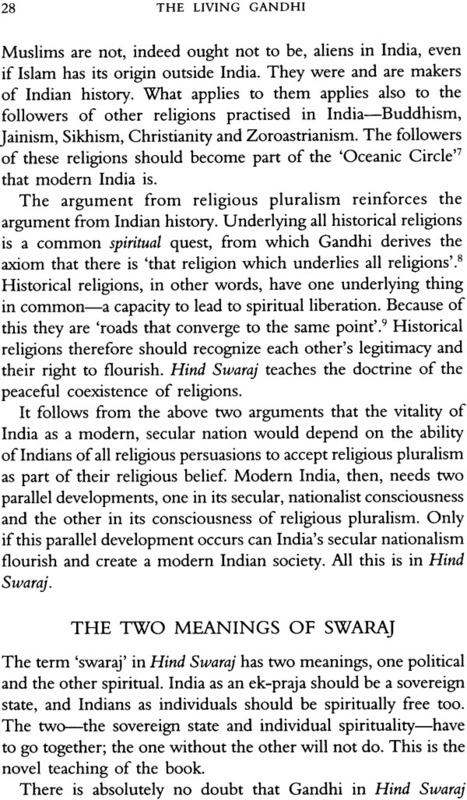 How Relevant Is Hind Swaraj to Today’s India? 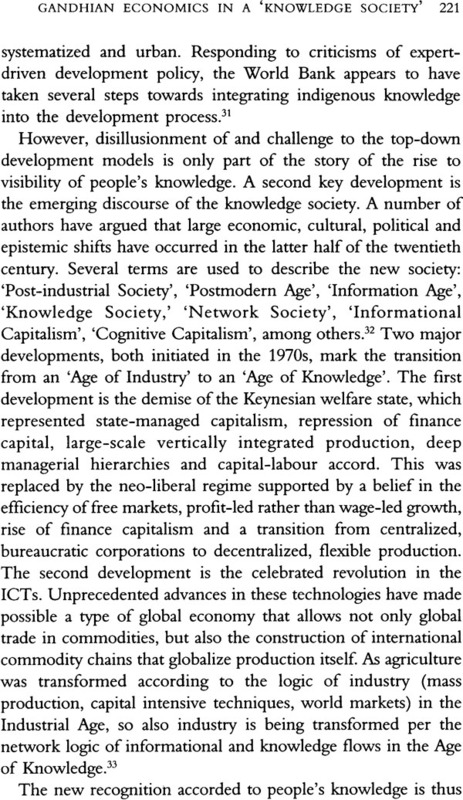 Reconstructing Its Role in Contemporary Curriculum.